NEW OFFICERS Carol Wertheim, Myrna Gintel, Marlene Zweig and Judy Zeller were introduced by member Jane Gilman, right. 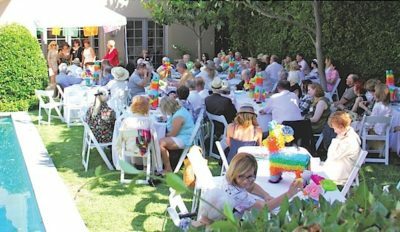 A talk on local Art Deco apartment buildings and a lively performance by mariachis were on the bill of the 41st annual meeting of the Windsor Square-Hancock Park Historical Society June 25. “It turned out to be quite a lovely event and the Historic Landmark Awards which were presented gave us such interesting history,” said incoming first vice president Myrna Gintel. The event was held in the garden of Robert and Brenda Cooke in Hancock Park. MEMBERS met in the garden of the Bob and Brenda Cooke home in Hancock Park. Other officers installed for 2017/2018 were Judy Zeller, president; Marlene Zweig, second vice president and committees secretary, and Chris Blakely, chief financial officer. This year’s Landmark Award winners included the Labiner-Moser home at 555 S. Irving. 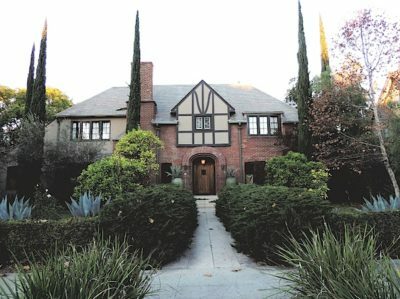 Built by contractor Harry Belden in 1923, it was designed by architect Raymond J. Kieffer, who built model homes for the Flintridge Company. He designed Italian, Spanish and English styles in the $30,000 to $100,000 price range at the time. Kieffer was later described as the “high society architect who built many Hancock Park and Beverly Hills mansions,” according to WSHPHS members Carol Henning and Carol Wertheim. Some of Kieffer’s homes are in their original condition, and many contain features that harken back to a bygone era, such as wrought iron staircases, stained glass windows and Batchelder fireplaces. 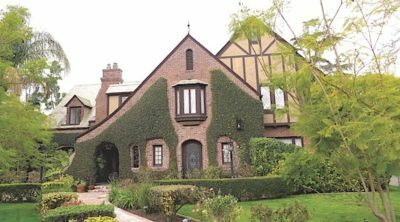 Architect Caroline Labiner-Moser and Dr. Franklin Moser acquired the home in 2004 and restored the original colors and features of the Tudor revival-style home. The second Landmark Award winner was another 1920s Tudor revival-style home located at 501 S. Lucerne. Designed by architects Harley Corwin and Everett Merrill, the house is named the Wright/Moore house after R.S. Wright, a building contractor and the original owner, and Dr. Edward Moore, its second owner. Features include exterior walls of multi-hued brick with half-timbering; a steeply pitched, multiple gabled roof, covered in slate tiles; diamond-paned and eight-light casement windows; a tall stepped-back brick wall chimney complete with chimney-pots and carved brackets supporting a slightly cantilevered second story. “A casement window set into the chimney provided a touch of whimsy,” wrote Carol Henning and Gary Marshall for the WSHPHS printed program. The owner of the home, Dave Goldstein, was the featured speaker at the meeting. Goldstein purchased the home in 2009 and undertook a complete renovation, restoring and upgrading the entire home. He also told the audience about his long experience buying, restoring and selling apartment buildings through his management company ArtDeco Apartments. Two of his buildings, the Mauretania on Rossmore, and one on S. Mansfield, have received Landmark Awards in the past. Also honored at the meeting was the former Gilmore Gas Station reborn as a Starbucks which received an award for Respectful Renovation and Adapted Re-Use. The former Art Deco-style gas station at 859 N. Highland Ave. was built in 1928 as a real estate office. The Gilmore Oil Company adapted the building in 1935 as a service station, one of the first constructed by the Gilmore Oil Company, according to WSHPHS member Carol Henning. In 1945, Gilmore Oil was bought out by Socony-Vaccuum which eventually became Mobil. In 1964, the station was modified by then-owner the Texas Company (Texaco) to a combination service station and auto repair facility. In 1992, the station was designated an Historic-Cultural Monument by the City of Los Angeles but shortly thereafter fell into disrepair. 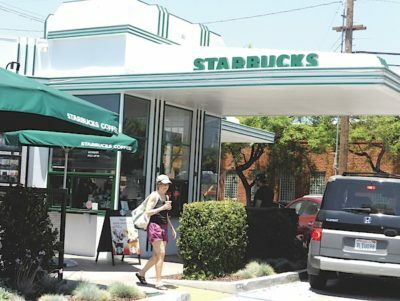 In 2014, Starbucks converted the historic gas station into a drive-through coffee store with a walk-up window and a 100- square-foot outdoor dining space. Thanks to the efforts of architect Niccolo Valerio, engineer Gregory Panek and KDC Construction, the “little Art-Deco landmark has been transformed from a station where cars would guzzle gasoline to a coffee shop where humans can guzzle frappuccinos,” wrote Henning. The next WSHPHS event is a tour of historic bungalows in St Andrews Place between 2nd and 3rd streets on Sun., Sept. 17 from noon to 4 p.m. For more information visit windsorsquarehancockpark.com.